My Thai in Chesterland is a hidden gem of a Thai restaurant and was voted among the Top 5 Thai restaurants in Cleveland on the 2014 Cleveland Hot List. It doesn’t look like much from the outside – being tucked in a small strip mall with a very small parking lot at the corner of Mayfield Road and Route 306, but the food is always fresh and delicious. The chefs use fresh ingredients and vegetables with no MSG, and they feature many vegetarian and gluten-free selections. 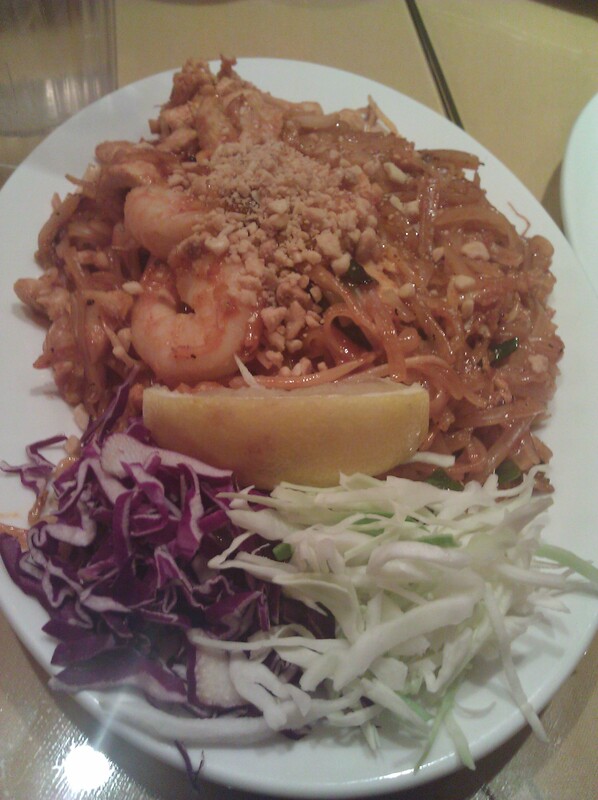 It is one of my favorite Thai restaurants in the Cleveland area. I have dined here with a large group, with a couple friends and on my own. I have yet to have a bad meal. First of all, to start I highly recommend ordering some version of their Spring Rolls. The wrapper is super crisp and not greasy at all, and the contents are light and flavorful. They come three to an order, and I really have to hold back not to eat them all and get too full for my meal. The same holds true for the Shrimp Rolls. 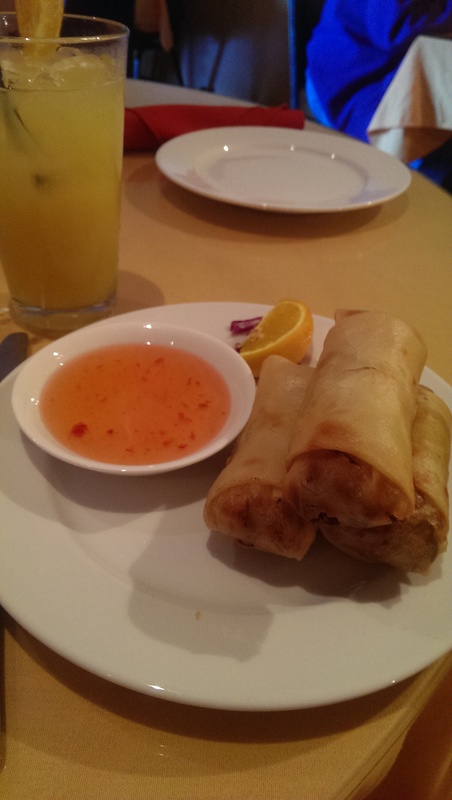 The Shrimp Rolls are large pieces of shrimp wrapped in the spring roll wrapper and fried. Delicious! Their homemade plum sauce, which is served with both appetizers, is also very delicious and light. 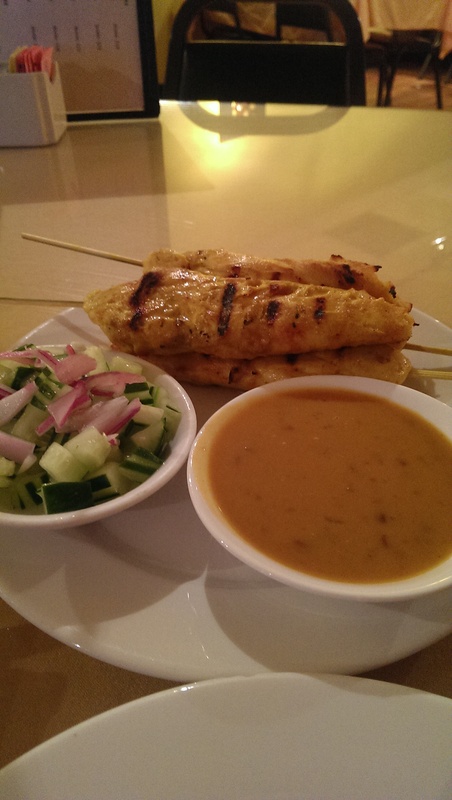 Another good starter is the Chicken Satay. It features four skewers of moist and delicious curried chicken breast served with a flavorful peanut sauce. The thing that really makes the dish for me is the slightly vinegary (but not overpoweringly so) cucumber and onion salad that is served with it. My only complaint is I kept spilling it. 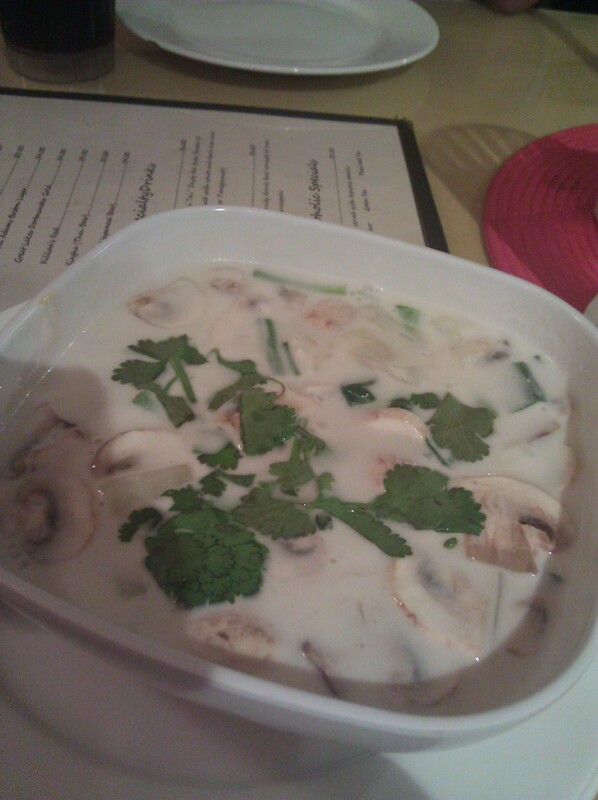 I can also attest to the Tom Kha soup. I am a huge fan of this coconut milk-based soup featuring onions, green onions, mushrooms, tomatoes and fresh Thai herbs. Another fellow diner ordered the Tom Yum soup and also enjoyed it. You can order any of the soups with vegetable, chicken, shrimp or seafood. The Tom Yum soup is a little spicier than the Tom Kha soup. 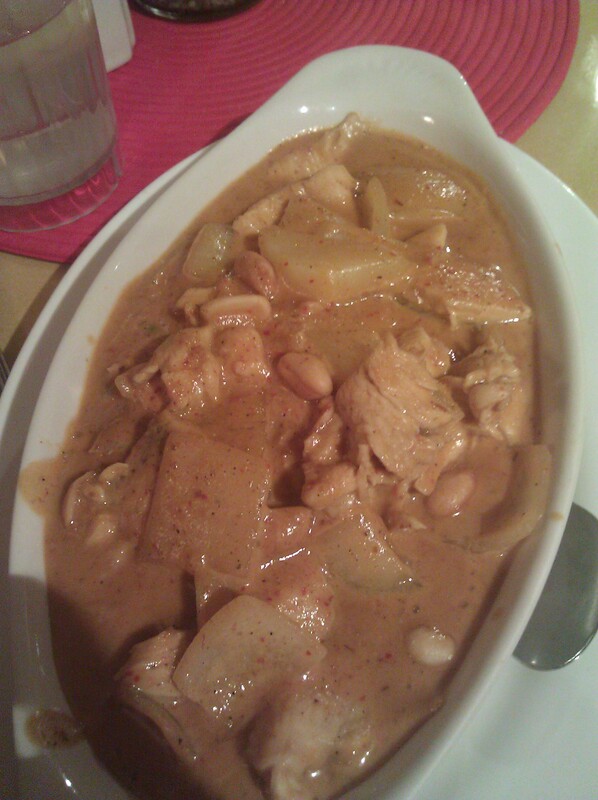 The Masaman and Peanut Curries are always a good choice. The difference between the two is that the Masaman Curry features potato, onion and whole peanuts in a Masaman curry paste with coconut milk, while the Peanut Curry is prepared with coconut milk, peanut cream, green beans, broccoli, and bell peppers. All of the curries can be ordered with your choice of just vegetable, tofu, chicken, beef, pork, shrimp, calamari, scallop or a seafood combo. Any of the curries are good. They even have a Jungle Curry for those who do not like coconut milk. Two special dishes that I think are worth mentioning are the Pineapple Fried Rice and the Pla Rad Prik. The Pineapple Fried Rice is a unique dish consisting of stir-fried rice, pineapple, egg, peas, onion, tomato, green onion, cashew nuts, and Thai herbs. Everyone who tried this dish absolutely loved it. It was perfectly prepared and just a huge knock-out. The Pla Rad Prik (or spicy crispy fish) is a Chef’s Special dish. It features either whole red snapper or halibut fillets, deep fried to a golden brown and topped with your choice of sauce, tamarind or garlic. The fish was indeed spicy and crispy when I ordered it. I had tried it at Siam Cafe and wanted to compare. This one held up to the Siam Cafe’s, and in my opinion it exceeded it. The dish was indeed spicy and served with the tamarind and pepper sauce. I ordered it as a cross between mild and medium, and it was just right for me. I left with a pleasant yet not overwhelming burn. The Thai Barbecued Chicken was also not what I was expecting and exceeded my expectations. The explanatory note on the menu does not do the “gravy” justice here. The chicken was perfectly cooked and moist and flavorful, and the “gravy” really complemented the chicken. No matter your taste, you really can’t go wrong ordering anything off the menu here. When I was here with a large group we filled two large tables and not a single person complained about their meal. It is rare to find a restaurant that can make everyone happy, and My Thai is one of them. Two of my friends come here very frequently, and they swear by the Tempura Fried Banana for dessert. Three lightly tempura battered banana and a large scoop of ice cream are perfect for sharing or indulging by yourself. Unfortunately we dug in without getting a photo of this dessert. I have had both the My Thai and the Love in Thailand cocktails. The My Thai is made with pineapple, orange and lime juice mixed with white and dark rum and crème de almond, while the Love in Thailand consists of rum, crème de banana, orange and pineapple. Both are refreshing.